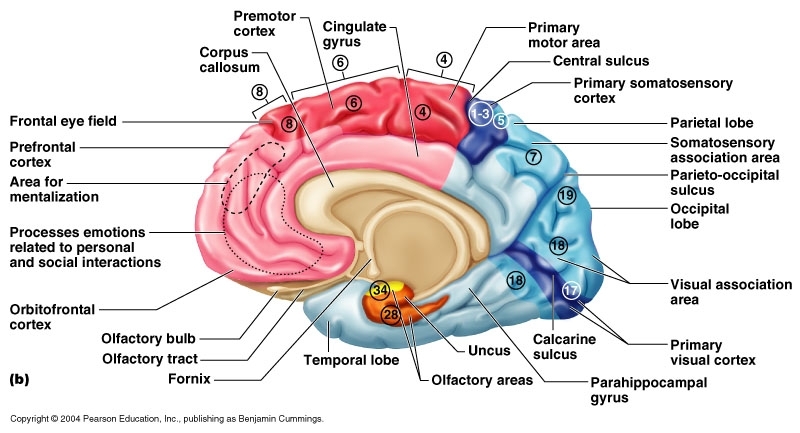 The cerebral cortex is joined to various subcortical structures such as the thalamus the basal ganglia, sending information to hem along efferent connections and receiving information from them via afferent connections. 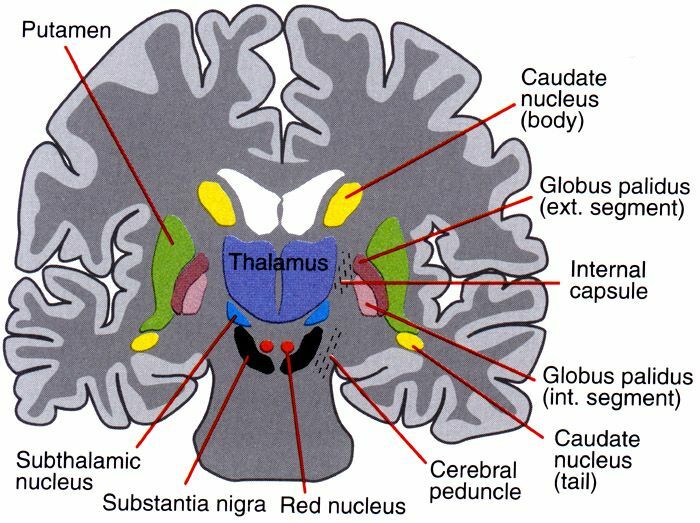 Most sensory information is mapped to the cerebral cortex via the thalamus. Olfactory information, nevertheless, passes through the olfactory bulb to the olfactory cortex also called the piriform cortex. The bulk of connections is from one area of the cortex to another, rather than from subcortical areas. Extracortilal afferents supply primary sensor area at the cortical levels, where the input fibers terminate, up to 20% of the synapses but that in other areas and other layers the percentage is likely to be much lower. 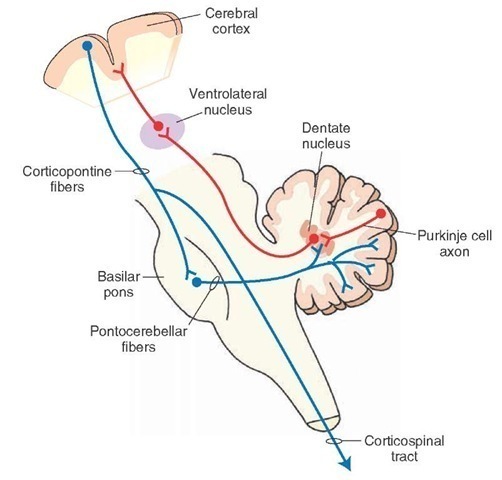 The cortex is usually described as containing three different parts: sensory, motor and association areas. The sensory areas are cortical areas that collect and process information from the senses. Parts of the cortex that collect sensory inputs from the thalamus are designated primary sensory areas. The sense of vision, audition, and touch are helped by the primary visual cortex, primary auditory cortex, and primary somatosensory cortex sequentially. In general, the two hemispheres obtain information from the opposite (contralateral) side of the body. An example of this is that the right primary somatosensory cortex receives data from the left limbs, and the right visual cortex receives data from the left visual field. The structure of sensory maps in the cortex shows that of the corresponding sensing organ, in what is known as a topographic map. 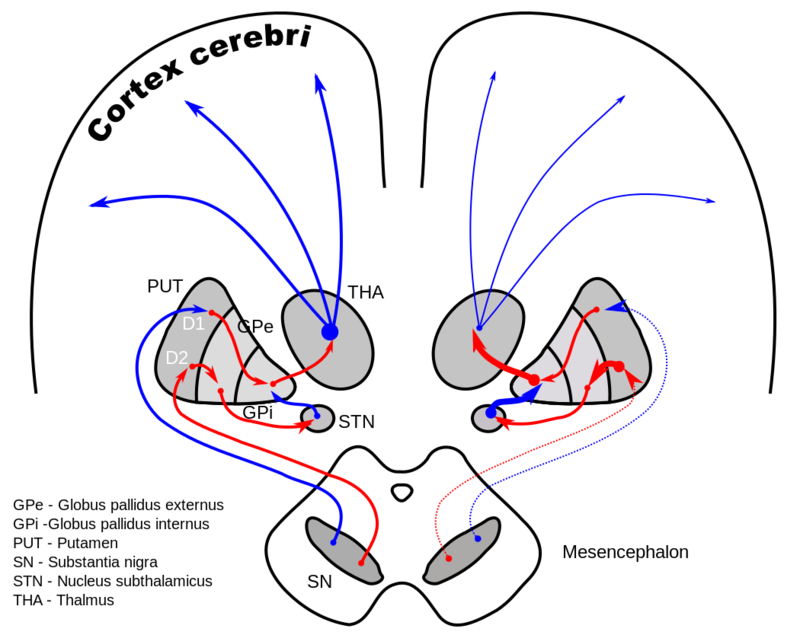 Nearby points in the primary visual cortex, for instance, correspond to neighboring points in the retina. The topographic map is called a retinotopic map. IN the same way, there exist a top ographic map in the primary auditory cortex, and a somatotopic map is the primary sensory cortex. The last topographic map of the body onto the posterior central gyrus has been portrayed as a deformed human representation, the somatosensory homunculus, where the size of various body parts reflects the relative density of their innervation. Areas with a lot of sensory innervation, such as the fingertips and the lips, require more cortical area process finer sensation. The motor areas are found in both hemispheres of the cortex. They are shaped like a pair of headphones stretching from ear to ear. The motor areas are quite closely tied to the control of voluntary movements, especially line fragmented movements performed by the hand. The right half of the motor area control the left side of the body and vice versa. Supplementary motor areas and premotor cortex, which decide voluntary moments. Dorsolateral prefrontal cortex, which determines which voluntary movements to make according to higher- order instructions, rules as self-generated thoughts. 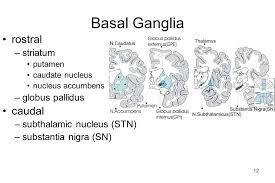 Just underneath the verbal correct are interconnected subcortical masses of gray matter called basal ganglia ( or nuclei). The Basal ganglia receive input from the substantial nigra of the midbrain and motor areas of the cerebral cortex and transmit signals back to both of these locations. They are involved in motor control. They are found lateral to the thalamus. The components of the basal ganglia are the substantia nigra, caudate nucleus, the subthalamic nucleus, the globus pallidus, the nucleus accumbens and, the putamen, The putamen and globus pallidus are also collectively known as the lentiform nucleus since they both form a lens-shaped body. The putamen and caudate nucleus are also collectively called the corpus striatum after their striped appearance. The association areas are the components of the cerebral cortex that do not belong to the primary regions. They function to create a significant perceptual experience of the world, permit us to interact effectively, and foster abstract thinking and language. The temporal, parietal, and occipital lobes – all located in the posterior part of the cortex 0 integrate sensory information and information stored in memory. The frontal lobe or prefrontal association complex is involved in planning actions and movement, as well as abstract thought. Globally the association areas are organized by distributed networks. Each network connects areas distributed across widely spaced regions of the cortex. Distinct networks are located adjacent to one another yielding a complex series of interwoven networks. The specific organization of the association networks is disputed with evidence of interactions, hierarchical relationships, and competition between networks. IN humans, association networks are particularly crucial to language function. In the past, it was hypothesized that language capabilities are confined to the Broca’s area, the left hemisphere in areas 44/45, for language formulation and area 22, the Wernicke’s area, for language receptions. However, language is no longer restricted to easily indefinable areas. More recent research suggest that the process of language expression and reception occur in areas other than just those formations around the lateral sulcus, including the frontal lobe, pons, cerebellum, and basal ganglia.